Massive stars have stellar winds. When two of these massive stars are in a binary system, their stellar winds collide. This wind-wind collision heats the material, leading to additional emission. The collision also creates synchrotron emission, because some of the electrons are accelerated to relativistic speeds at the collision shocks. The synchrotron emission is most easily detected at radio wavelengths. The radio fluxes increase and decrease as the distance between the two stars in their eccentric orbit changes, because the strength of the wind-wind collision changes. 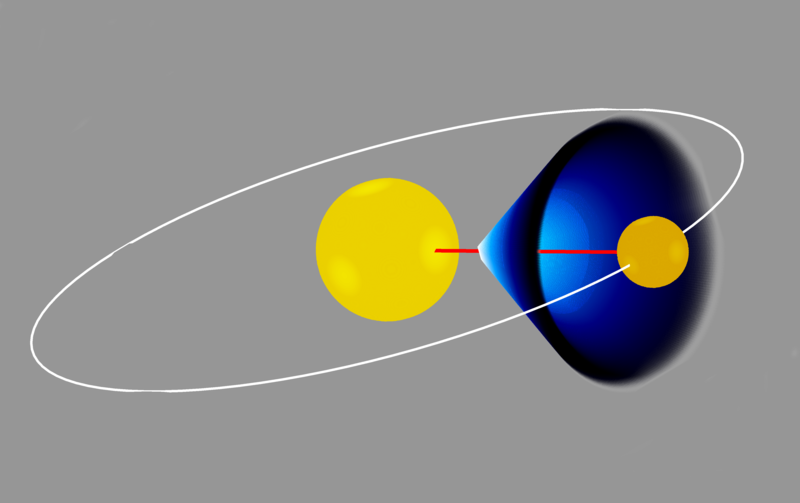 As the two stars orbit around one another, the stronger stellar wind collides with the weaker one, and forms a cone-shaped region where synchrotron radiation is emitted. 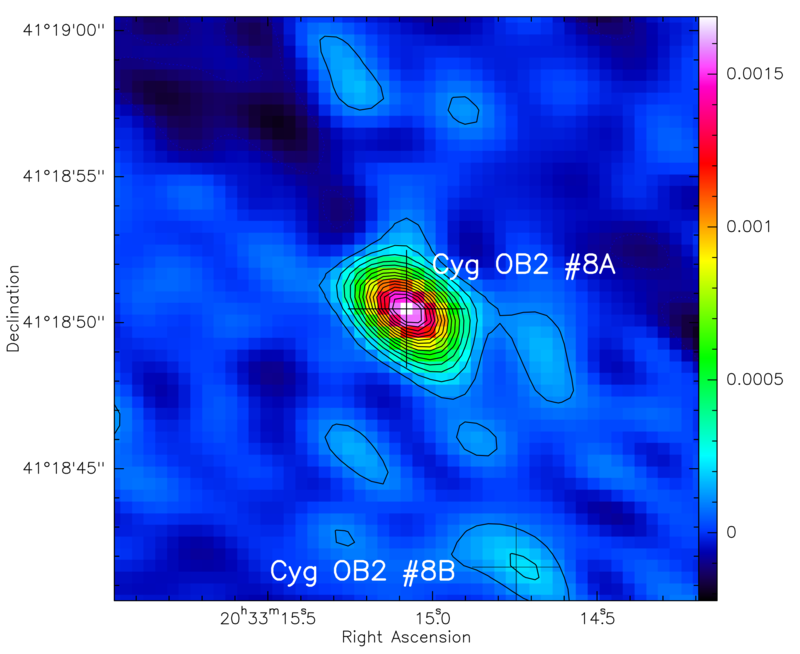 Ronny Blomme and colleagues from the Université de Liège and University College London observed Cyg OB2 #8A. This is a highly eccentric binary system with a period of 21.9 days. Radio observations were obtained with the Very Large Array (VLA) and millimetre observations with the NOrthern Extended Millimeter Array (NOEMA). 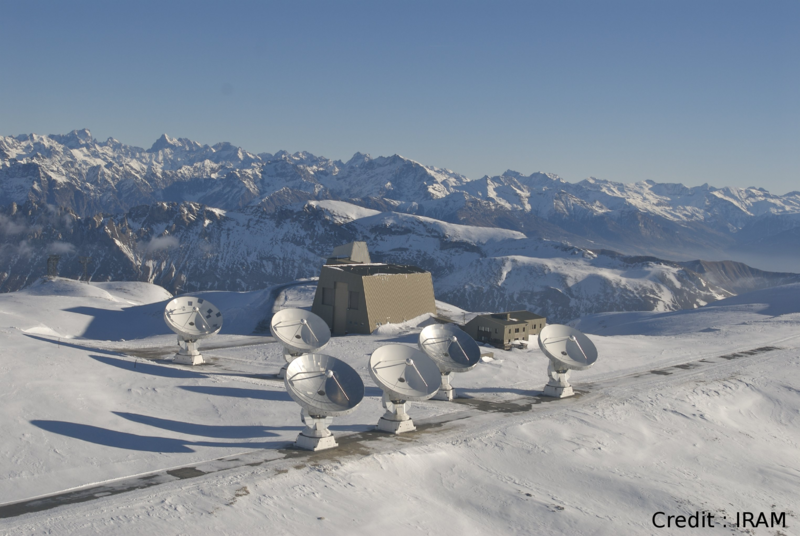 Both instruments are not single telescopes, but consist of a number of antennas that are used together to make an observation. There is a good reason why multiple antennas are needed at these long wavelengths. 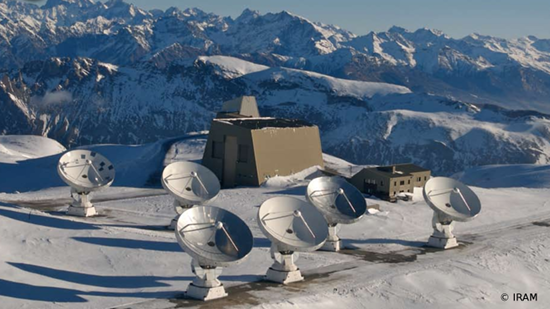 A single radio or millimetre telecope, even with a large dish, does not see very sharply. But by combining the information from different antennas, in a technique called interferometry, a much sharper image can be obtained. The image we made from the NOEMA data clearly shows Cyg OB2 #8A. Somewhat to our surprise, we also managed to detect its visual companion, named Cyg OB2 #8B. This is also a very massive and luminous star, but not a binary. From the NOEMA data we were able to determine its mass-loss rate due to its stellar wind. The 3-mm map showing both Cyg OB2 #8A and #8B. Figure adapted from R. Blomme et al. (2017, A&A 607, A69). 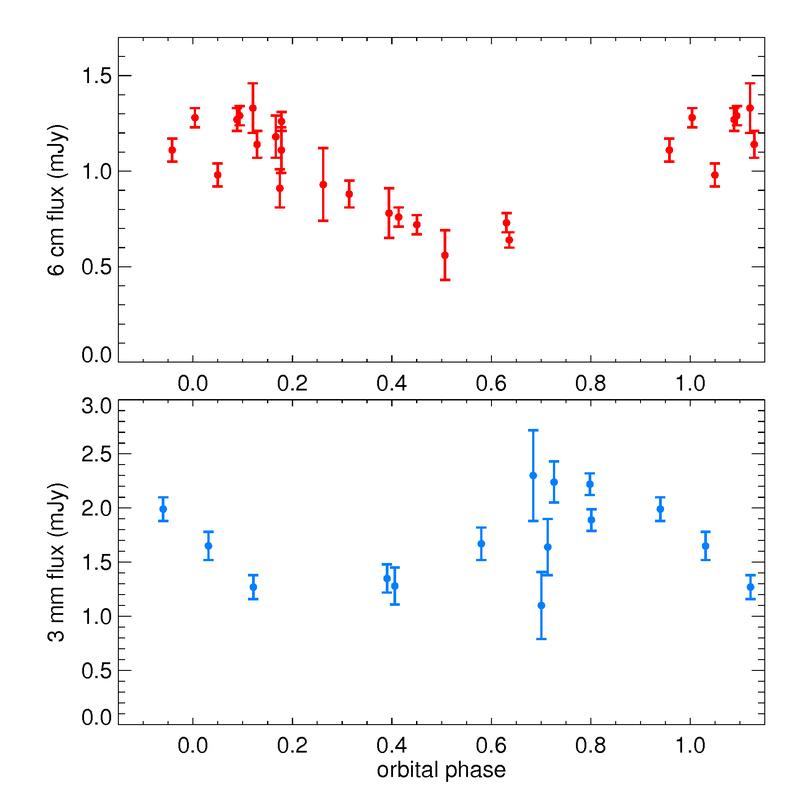 When we plot the Cyg OB2 #8A fluxes as a function of the phase in the orbit of this binary system, we see that they increase and decrease with the orbital phase. One reason was already mentioned: as the distance between both stars changes, the strength of the wind-wind collision changes, and therefore also the amount of synchrotron emission. A second reason is that this synchrotron radiation has to get through the stellar winds of both stars before it can reach us. While doing so, some of the synchrotron radiation is absorbed. How much is absorbed, depends on the configuration of both stars and the wind-wind collision region, which in turn depends on the orbital phase. The 6-centimetre radio fluxes and the 3-millimetre fluxes of Cyg OB2 #8A, plotted as a function of the phase in the binary orbit. Figure adapted from R. Blomme et al. (2010, A&A 519, A111 and 2017, A&A 607, A69). A theoretical prediction claims that, at millimetre wavelengths, we would start seeing more radiation from the heated material, rather than from the synchrotron emission of the accelerated electrons. 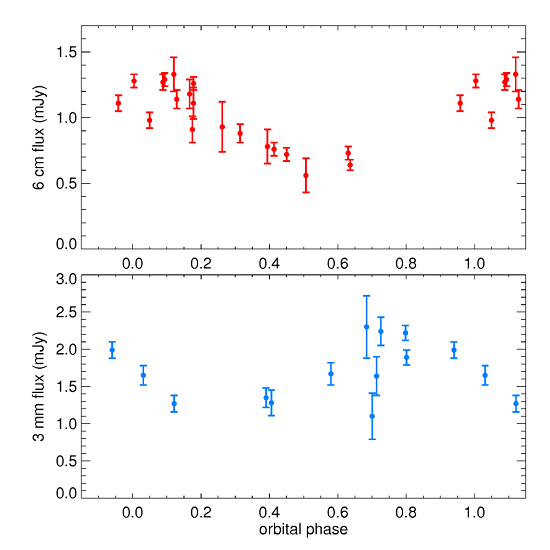 Our theoretical modelling of the Cyg OB2 #8A observations shows that for this binary system the 6-cm radio fluxes consist almost exclusively of synchrotron emission. But for the 3-mm fluxes it is most likely that both the heated material and the synchrotron emission contribute.